Pain is the major symptom of hip arthritis. Typically, the pain is felt in the buttock, the groin and around the hip joint. The pain sometimes radiates down the leg towards the knee but rarely below the knee into the foot. Some patients often complain of pain in their back and down the back of the leg to the foot. This may be related to sciatica. Arthritis is the wear and tear of the cartilage that covers the ball and socket. Healthy cartilage normally allows the joint to run smoothly. However, as arthritis develops from mild to severe, the cartilage becomes thinner and develops cracks within it until bone is exposed so that severe arthritis ends with bone rubbing against bone. 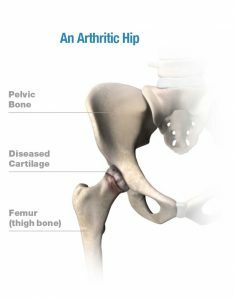 What can be done about my hip pain? Injections are occasionally possible but these are normally reserved for painful knees. You will always be expected to have exhausted all these measures before a discussion can be had regarding surgery to relieve your pain. The assessment of whether to proceed down this route will be made between a Consultant Orthopaedic surgeon and the patient. The last resort is surgery. 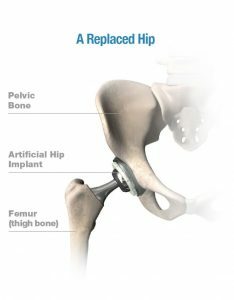 There are various types of hip replacements that are aimed at alleviating your pain. 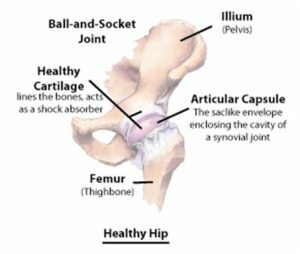 A hip replacement is an operation that replaces the worn out surfaces with an artificial bearing surface which runs smoothly. Essentially, both the ball and socket surfaces are replaced. How am I prepared for theatre? You will need a pre-operative assessment to assess your suitability to undergo the stresses of surgery. This will either be performed by a nurse or occasionally an anaesthetist. The aim of the surgery is to improve your pain, improve your mobility and hence improve your quality of life. You will find that everyday activities such as walking, sitting and driving will be more comfortable. The arthritic pain disappears straight after your operation and you will be mobilised the day of surgery and usually discharged 2-3 days later. The pain from the operation subsides over the next few weeks, so that by 6 weeks you should be able to drive again. You will be expected to adhere to strict precautions in the first 6 weeks, which includes not crossing your legs or bending down too far. You may have either a general anaesthetic, where you are put to sleep or a spinal anaesthetic where you are numb from the waist down. You may have sedation with the spinal anaesthetic in order that you can go into a sleep and wake up 60-90 minutes later. The wound will be about 8-10 inches long depending on your size. The ball is removed and replaced with an artificial ball with a stem that may be secured into the thigh bone with or without medical bone cement. 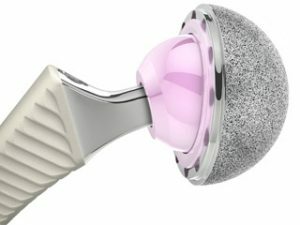 The new hip socket has the remnants of articular cartilage removed and a new socket can be inserted with or without the use of bone cement. There are various options for the bearing surface between the new ball and socket components. This is normally metal on very hard plastic. Some patients are deemed suitable for a ceramic ball. Patients will spend some time in the recovery room before being transferred to the ward. There will be some discomfort in your hip if you have woken from a general anaesthetic but no pain if you have had a spinal anaesthetic (this takes 4-6 hours to wear off). You will be attached to some monitors to check your heart rate and breathing and will be have a wedge pillow between your legs. You will have adequate pain relief that will include pain killers given through a drip in your arm. It is also possible to use a morphine pump. You will be mobilised within a few hours of your surgery. After 24 hours you should be taking tablets by mouth and walking around the ward and to the toilet. You will be cared for by the ward nurses and your rehabilitation supervised by the on site physiotherapists. You will have a blood test after your surgery to check your blood count is satisfactory. An X-ray is normally taken soon afterward to check the position of the implants. What precautions must I take after my operation? 1. Do not bend the hip too far. Your knee should not be above your hip as this may risk a dislocation. 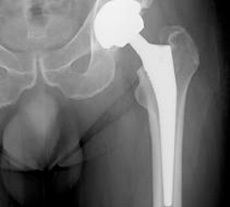 Hip replacement surgery is a very successful surgical procedure. However, as with any form of surgery, there are risks and complications that need to be taken into account before you decide to proceed. • Infection – this is the biggest concern for an orthopaedic surgeon and we take very careful precautions in order minimise this risk. We operate in very strict conditions in theatre and you will given 3 doses of antibiotics. You will be reviewed at 2 weeks for a wound check and to ensure you have not developed a deep vein thrombosis.